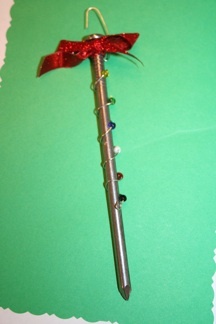 This Christian Christmas Ornament idea originated from wanting something special for our Heart to Home ladies’ group to be able to make for Christmas. At our house, we have the tradition of hanging The Christmas Nail first on our tree. After searching for that type nail and thinking of other ideas, I ended up with the idea for The Salvation Nail. It’s simple to make and can be a Christian Christmas ornament used each year to remember and share the story of the Gospel! 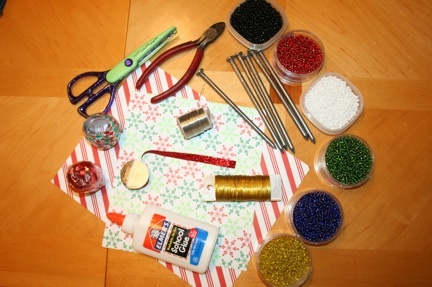 Items you’ll need: 6 inch nails, glass beads (black, red, white, blue, green, gold), gold or silver wire, your choice of ribbon. For backing poem: decorative card stock, craft scissors, glue. Instructions: Cut an 8 in. piece of wire and bend one end so that beads will not slide off (you may need pliers). Slide the beads onto the wire beginning with the black, then red, white, blue, green and gold. I chose to place the black bead on the bottom and build up to the gold to represent moving from the pit of sin up to the glory of Heaven. Hold the black bead and wire tightly towards the bottom of the nail and begin winding the wire up the nail while sliding each bead towards the top, leaving one with each twist of the wire as seen in the photo. Once you have reached the top, tighten the wire and beads the best you can so they no longer slide. At the top you may kink the wire and then tie a bow over the end or curly-q the wire in a decorative fashion to hang a hook. Either way, I still added a little ribbon for color. The poem that goes with this Christian Christmas ornament will help to remember the meaning of the nail and the colors of beads. It can become a tradition to teach your children the salvation message or can be given as a witnessing gift to someone else. I would even give a family challenge to memorize the Scriptures for each bead! We can find life's answers-just look upon our tree! A reminder pointing simply, that Christ's salvation's free! but that was only the beginning; He really came to die. It all reminds me here at Christmas, If not for Him, I'd still be lost! The colored beads tell me - the way to Heaven is clear. His death, His burial, His resurrection, Paid the way for me to draw near. So let's take time to seek Him out and find that He is real. A heartfelt prayer is all it takes - a surrender of our will. Print the poem onto cardstock or regular paper and then glue to Christmas cardstock that has been decoratively cut. It may be hung with the nail, or placed on a nearby table for decoration.